As well as being an avid writer, I am also an enthusiastic gamer, anime fan, movie buff, and love of all things strange. Being as I live with a boyfriend, I am also particularly knowledgeable about cleaning and cooking. You can join me in my adventure of writing for money here at Infobarrel. Sign Up today! Also, I wrote a book! Check out The Guild today! Many may believe that living in a small space means that you will likely have to do without certain things. This can be true when you find your room being physically smaller than that dream king sized bed, but really, when the space is utilized efficiently and correctly you can fit just about anything anywhere. I lived in a small house growing up. I had an even smaller room there. When I went to college, I lived in what was essentially a tuna can. The apartment I live in now is a small place and I can only imagine my future house will be small. So I am pretty much the authority on making the best of small spaces. It took some serious experimenting, and a little bit of watching HGTV, but ultimately, I have learned that trying to make all the things you want to fit in a small space or just making it feel a little less claustrophobic is a fun exercise in creativity. Before doing anything else, have a sit down with your stuff. Decide which of it you need and which of it you can part with, store in other rooms if possible, or put in a container. This can be difficult if you have some hoarding tendencies, even if they are minimal, some things you just have a problem letting go. Like old magazine, for example, maybe you keep them for beauty tips or just because you might read through them someday. Go through them, maybe put the articles you want to keep in a scrapbook, but otherwise they are just taking up space. There is a fine line between decluttered and being an obsessive minimalist, though. Never let anyone tell you that you can't have a few decorations or things you don't necessarily need. However, if you are working with limited space, you have to limit yourself. This is probably been the greatest tip behind my personal success. You don't need bookshelves and dressers that take up valuable floorspace. Try going up instead! Get yourself a level, a stud finder, some screws, a power drill and some brackets and start building shelves. Alternatively, find someone else to build shelves. Hang hooks for bath towels, coats and hats. Build small shelves by your desk for books, magazines, and other knickknacks. If you have a particularly empty corner in a room, perhaps under some shelves, build another rack to hang some of your prettier clothes from. You would be amazed how building up onto walls and limiting what you put on the floor opens up a room. There are two things I love to shop for: glassware and furniture that serves multiple purposes. There are so many options for furniture that do more than one thing. 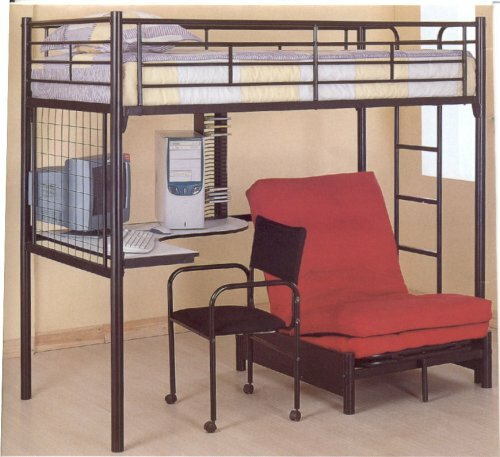 For example, a bed frame that has a bed on top and a desk on the bottom. Those are popular in dorm rooms to save space, but after awhile as an adult the allure gets old. However, it is perfect for a small child's room. Run out of space to put things on walls without it looking really strange? That's okay. Find things like ottomans that serve as a place to sit, but open up to become storage. Find a bed frame with drawers underneath of clothes or other miscellany. Essentially the best way to expand a space is to have all or almost all multipurpose objects. Why have just a table when you could have a table with a drawer in it to store things? Perhaps the problem with your small room is not how much stuff you have, but you find yourself feeling a bit constricted. Mirrors are the oldest trick in the decorating book for small rooms. Anyone who has ever been to a gym will know why. They plaster a side of the room with floor to ceiling mirrors and a small room looks twice as big. However, adding floor to ceiling mirrors in a domestic room is a bit excessive. Mirrors, even decorative ones hung on the opposite wall from a window does wonders to open up the room. It makes you feel as if you magically gained another window and will almost always forget about how little space there is behind you. Aside from creating the illusion of another window and depth, mirrors will help keep your room bright during the day time. A dash of color, as I will be discussing later, can open up a room however keeping the room light will always make it seem like there is more space than there actually is. Sometimes it is not about increasing space, but making your mind think you have. This was the concept with adding mirrors, but it is also the concept behind picking appropriate colors to paint your room if you can. The general rule for keeping a room looking open and spacious is to bathe it in white. It works, but white can get boring after awhile. Try using color accents on walls to help open the place up while still keeping it looking interesting. Like with mirrors, paint the opposite wall to give the illusion of depth. Avoid red and black at all costs. Red may be so tempting as it can make a room so beautiful if done right, but it also constricts the room. It makes it cozier instead of more spacious. If you have a particularly large window, try a earthy spring green tone instead, with white accents. Or instead, use small accents of colors opposed to painting a whole wall. However, not too many colors, then things will just be chaos. For some reason, hard sharp edges constrict a room. If you have a closet, whose hard doors are staring you right in the face all day, do something about it. Try removing the closet doors and replacing them with a curtain. Get desks and shelves that end with a curve instead of a point. Making the décor softer, at least in its curves makes thing look a little more spacious. At least to me, it has always been that way. Plus, things look a little more exciting. Great article. Sometimes you don't need to remodel a room, just redecorate it to make it seem bigger. Love this article. I'm in the process of downsizing again. I like everything to be neat and lately cannot stand to see too many stuff. you're so right about "how difficult it can be if one tends to be a hoarder" or have too many nice stuff. the pictures are beautiful, and gave me some ideas. Thanks!! I really need to learn to do this. I have plenty of room, but I could use the space so much better.